(TibetanReview.net, Jul06, 2014) –China said Jul 4 that Gyaltsen Norbu, the man it had chosen and is grooming as the Buddhist religious leader of Tibet, had concluded his annual tour duty of the region that day. Its official Xinhua news agency reported that the man it had chosen in 1995 as the 11th Panchen Lama, Tibet’s second most prominent religious figure, as a deliberate snub to the exiled Dalai Lama, had begun his tour on Jul 1. The report described Gyaltsen Norbu, 24, as “one of the two most revered living Buddhas in Tibetan Buddhism,” visited Jokhang and Sera monasteries in Tibet’s ancient capital Lhasa and performed rituals, including sutra interpretations and blessings. It did not say who the other most revered living Buddha was, given China’s aversion to mentioning the Dalai Lama’s name in any positive term. The report suggested that Gyaltsen Norbu performed his tour duty as a member of the Standing Committee of the Chinese People’s Political Consultative Conference (CPPCC) National Committee, China’s rubberstamp political advisory body, and said he met CPPCC members in Lhasa. Gyaltsen Norbu, in his capacity as the Chinese government appointed 11th Panchen Lama, is also a vice president of the Buddhist Association of China. The Tashi Lhunpo Monastery in Tibet’s second city Shigatse is the traditional seat of the Panchen Lamas. However, Gyaltsen Norbu lives and studies in Beijing, groomed by people chosen by China to be a Chinese patriot. The Xinhua report did not suggest that he visited Tashi Lhunpo this time. 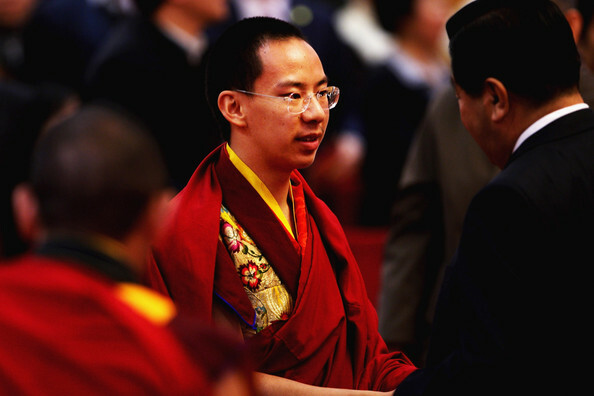 China appointed Gyaltsen Norbu as the 11th Panchen Lama as a rebuff against the Dalai Lama, Tibet’s exiled spiritual leader, after he recognized on Jun 14, 1995, 6-year-old Gedhun Choekyi Niyma as the reincarnation of the late 10th Panchen Lama who had passed away under questionable circumstances on Jan 28, 1989, aged 55. China kidnapped Gedhun Choekyi Nyima and his family three days later, to be never seen or heard from ever since. It has refused access to him despite a number of calls and request from across the world, including top UN human rights officials, government leaders and international human rights bodies.